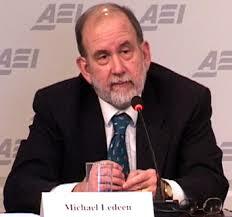 Neoconservative historian and writer Michael Ledeen has left the American Enterprise Institute, his intellectual base for almost two decades, Mother Jones has learned. The decision for Ledeen, a veteran of the Iran contra affair, and AEI to part ways “has been in the works for a while” an associate who confirmed the recent departure describes. (Ledeen is no longer listed among the think tank’s scholars). For those who follow foreign policy events at the think tank, one might have noticed that Ledeen has been absent for the most part from many of AEI’s public events for the past several months. From afar, one sensed that Ledeen may be too controversial for AEI’s other scholars to want him to be the public face of the think tank in particular on Iran issues, an observation the associate described as reasonable. (See this and this for background). Ledeen did not immediately respond to an emailed request for comment. And yet, while AEI’s in house team of foreign policy hands (Frederick Kagan, Danielle Pletka, etc.) has noticeably restrained itself from as aggressively publicly promoting a military option on Iran as might be expected, still it is home to those such as former US ambassador to the UN John Bolton who says whatever he wants — almost always predictably disparaging of a diplomatic solution to any crisis from North Korea to Iran. And as a longtime loyal home for many who were associated with the most hawkish positions of the Bush administration (Bolton, Paul Wolfowitz, Lynn Cheney and formerly her husband), it’s hard to imagine that it was any extreme ideological position which would have prompted the departure. And Ledeen was described as always a good fundraiser for the think tank. So his departure is somewhat perplexing. Ledeen is not alone in being scarcer at the influential think tank of late. Former Reagan administration Pentagon official Richard Perle is often in France and rarely makes public appearances at AEI any more; but there’s no talk of Perle leaving AEI, although his role there is largely “emeritus” the associate described. Ledeen is now the Freedom Scholar at the Foundation for Defense of Democracies, a small Washington think tank headed by former Republican National Committee spokesman Cliff May. … I always thought it was stupid to go to Alaska in August. I love August in Washington, I adore hot and humid and so Washington is a dream come true for me. Plus, no Congress, which means much less traffic, and you can get tables in restaurants. Plus, I moved my office from AEI after twenty happy years, to Cliff May’s rising Foundation for the Defense of Democracies. It seems a good fit, it puts me in the same sandbox as Andy McCarthy and other terrific people, and I love the email address: michael(at)defenddemocracy.org I mean, that’s what I’m all about. So I’ve been packing and unpacking and cleaning out my files, throwing out two decades’ worth of notes, urgent to-dos that ended up at the bottom of a pile, highlighted clips, you know. And finally it got done. Just in time to start a new book and sign up for a new parking lot. I’ll be a better blogger for it. In noting this post on Ledeen’s move, Steve Clemons offers a priceless anecdote about how you can never really leave any of these think tanks.